Like Noah Baumbach’s Margot at the Wedding, Tamara Jenkins’s The Savages is an equally dysfunctional independent film erroneously advertised as a comedy filled with characters that viewers will tire of after only five minutes despite the fact that the cast is comprised of Oscar nominees and winners. Slums of Beverly Hills director Jenkins opens her film under the pretense of comedy (although one that disturbingly seems to be laughing at the subject rather than with them) by showing a group of elderly women cheer dancing in Sun City, Arizona—women whom some viewers were giggling at but some of us with parents or grandparents of the same age were immediately saddened by—women whom we never see again. Lenny Savage (Phillip Bosco), suffering the beginnings of a rapid dementia that’s caused him to lose all inhibition and the ability to look after himself, is thrown for yet another loop when his girlfriend of two decades dies and the papers he’d signed as a sort of “cohabitation pre-nup” state that he must vacate his former lover’s home. 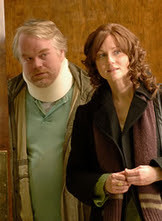 Lenny’s two adult children, Wendy and Jon Savage (Laura Linney and Philip Seymour Hoffman respectively) arrive on the scene from New York to whisk their dad out of sunny Arizona and try to find him suitable nursing home housing back east and, as predicted, the laughs stop coming with all of the tongue-in-cheek humor and one-liners being saved for the misleading trailer. Despite the fact that, as Rolling Stone’s Peter Travers wrote, Jon and Wendy have names “out of Peter Pan… their life is no fairy tale.” Jon seems to be the more functional of the two, working as a professor in Buffalo, New York and tirelessly plugging away at his scholarly book on Brecht instead of dealing with his commitment-phobia when his serious girlfriend of three years is forced to return back to Poland as her Visa is running out since he’s unable to marry her. Compulsive liar Wendy, a train-wreck from the moment we see her, is embodied by the always pitch-perfect Laura Linney as a sort of thirty-nine year old kid (and indicative of the Peter Pan influence she shares with brother, someone who never wants to grow up) employed as a temp who steals office supplies and works on letters for artistic grants to finish her autobiographically whiny play about her horrid childhood by day and having a none-too-romantic affair with her married loser neighbor by night. Although it’s the immensely gifted Hoffman whose character we’d rather spend any time with onscreen and he was nominated for Best Actor from the Golden Globes (inexplicably labeling the film as a comedy), he has less screen-time than Linney and we quickly realize that despite Linney’s acting talent, Wendy isn’t exactly someone we neither care to have as our tour guide nor root for and this unlikability of not only the characters but the color-palette and grim subject matter made Jenkins’s film feel infinitely longer. As was the case with Margot at the Wedding, word-of-mouth by audience members is sure to hinder the box office performance as viewers begin to sour on the influx of so many overly indulgent independent films mislabeled comedies with such aggressively unpleasant characters whose annoying quirks the directors unfortunately assume will be charmingly offbeat. To quote Steve Martin in Planes, Trains and Automobiles, “everything is not an anecdote” or in this case a film that audiences will actually want to see.